This section is taken from Chapter 4. Title character Irina is still coming to terms with the fact that ‘variant’ really means mutant with a noticeable gift or ability. 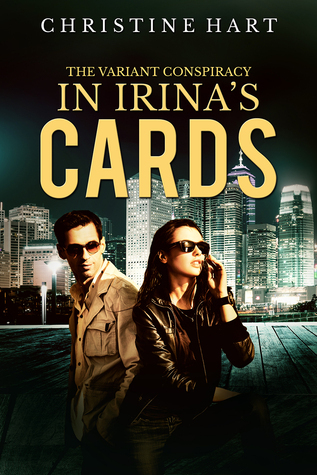 We get a chance to see Irina having a vision. And we get a first glimpse at the aquakinetic, pyrokinetic, and impossibly strong variations in three other core characters. We reached the end of the Harbour and the coastline opened up around the corner. I saw a sign for ferries to the US in front of a giant concrete breakwater and a pub decorated with a helm wheel and a mural with starfish and orcas. The hazy soft blues of the ocean and sky were broken by the jagged edges of American snow-capped mountains on the horizon. The seaside sidewalk had a mix of young families, dog-walkers, and spry seniors in trendy windbreakers. I looked around the yard and fortunately we were alone. Still, I didn’t want to keep talking about this stuff where we could be overheard. More importantly, what was Rubin doing sharing my personal information while giving me his best poker face? “Let’s go inside. I’m hungry.” I didn’t much feel like sitting down to a social night anymore. Cole waved from a table on the other side of the building. Sitting next to him, a girl with purple dreadlocks looked up from her purse and smiled. The restaurant was full and the combined conversations created a loud chatter. Dim candlelight, a few glass chandeliers, and an antique-looking piano in the corner set a romantic atmosphere that sparked another twinge of embarrassment. On the other hand, the abstract and industrial mixed media wall décor had me looking around for art and film students. Aside from a few biker bars, the edgiest hangout I knew of in Prince George was an indie coffee shop – and it had only been open for a few years when I left. We made our way around and between tables. Everyone in the restaurant looked like an artist or an intellectual. I felt like an ugly duckling in my plain, boring clothes, but I was glad for the first time since starting my new job that not all of the blue dye had gone from my hair. Jonah reached the table and pulled out a chair for me. We sat down and Cole scowled. “Dude, what’s up with the timeline fail? We’ve been here for like, half an hour,” said Cole. “Ignore his attitude. I’m Faith,” the girl said as she extended her hand to me and grinned happily. The flickering light glinted off a stud in her nose and a ring in her eyebrow. She wore dark makeup on her eyes and mouth. She had the same coffee brown eyes as Cole. I couldn’t tell if it was her features or the eyeliner and lipstick, but she looked striking in a bold, exotic way. As we shook hands, her gaze shifted over to Jonah. We looked at our menus in awkward silence, waiting for a server, sipping our water. I sighed and put down my menu. I could feel Cole’s eyes on me as I watched Faith stare at Jonah, the only person still looking at his menu. I gave in and glanced back at Cole briefly with a small smile. This was all heading in the wrong direction. The time for tact expired along with my patience. “So I take it we’re all mutants here,” I said casually. Jonah sprayed water onto his menu and coughed. Cole looked at me urgently. Faith’s mouth made a small ‘O’ under her confused frown. Jonah looked at me and took a breath as if to say something. He decided against it and looked around our corner of the restaurant. Nobody paid any attention to us. He placed his hand over the droplets of water on his laminated menu. The water coalesced into puddles under his palm. As he concentrated on the small pool, it lifted off the menu and spread into a donut shape. The circle broke and the stream became a spiral, getting thinner and thinner until it evaporated into steam, absorbed into Jonah’s hand. Faith’s frown turned into a smile as she looked at Jonah. She picked up one of the unlit candles on our table and pinched the wick between her thumb and forefinger. As she released it a flame sprang to life. “Well, I’m not breaking this table, that’s for damn sure,” said Cole. “That’s okay. I saw your street-fight with that bouncer when I first got to town,” I said. Cole rolled his eyes, but I couldn’t worry about his temper. I wanted to keep talking about Innoviro and Ivan. “So, now that we’re making progress, albeit moving into some surreal comic book world, tell me what’s the deal with Innoviro. What the hell does this company really do?” I felt my adrenaline rise. “Dude, leave it alone!” said Jonah. “And what if I don’t need help?” I said. “You may help others. We’re not all different in the same way. Some of us were born this way and some of us were … made,” said Faith. “Ivan will talk to you about all of this soon enough. We’re really not allowed to and I think the reasons for that will start to be obvious. It’s not the kind of research the government likes. You can’t put this kind of stuff in a job posting and you definitely can’t chat about it at parties.” Jonah looked around the room again. “Hey, we’re not screwing around here! Jonah and I were recruited directly from our graduate programs. I was working on a master’s in geology and Jonah had nearly finished his thesis in microbiology. Don’t you think research like this is best conducted by someone who understands it first hand? Could you imagine trying to convince a serious scientist to take this on, in lieu of a real career? You’d have to divulge every secret Innoviro has just to get them to believe the work can be done, let alone get a commitment.” The table crunched under Cole’s grip. “Wow. I feel like a complete dunce.” I had nothing unique or meaningful to contribute to Innoviro. Nothing but a tissue sample. “Don’t be intimidated. Remember that you were recruited for a reason. You probably won’t get to know everything the company does. We don’t discuss the details of our work with anyone but our supervisors,” said Faith. “What?” said Cole and Jonah in unison. “And you know why I didn’t get a look at him?” I said. The boys had quizzical looks on their faces, but Faith looked anxious. “You need to tell Rubin. Or Ivan, but not everyone in this restaurant.” Faith scanned the room tensely. “I’m sure he is. It’s his job to keep us safe,” said Jonah.